You either love sushi or you don’t. There are no grey areas here. And the ones, who do, literally salivate by the mere mention. Count us in this category. 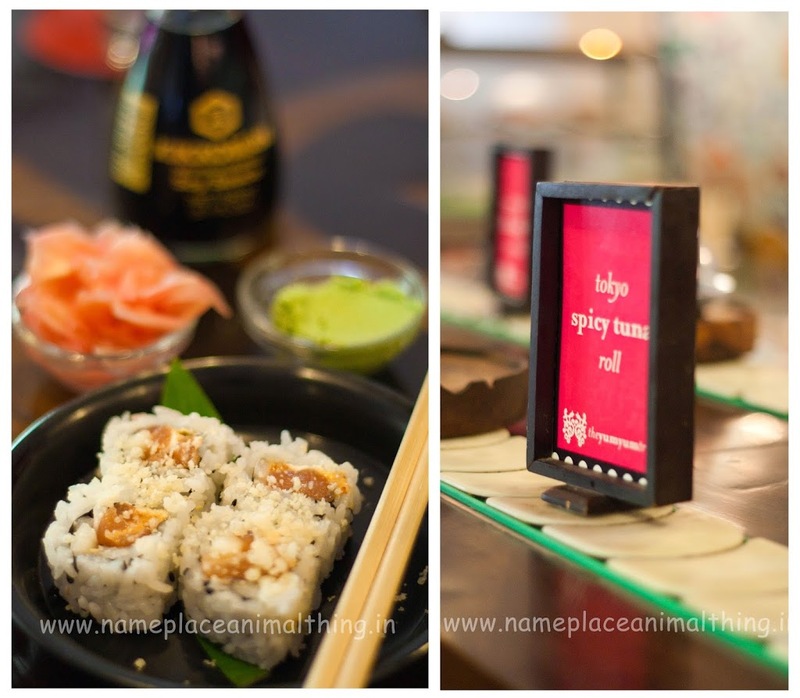 After trying many places, we finally managed to locate Yum Yum Tree, which offers an assortment of Sushi’s at a very economical price. But that’s not all; the pan Asian restaurant also serves contemporary Chinese, dim sums, Japanese rolls and fragrant Thai. While the À la carte has a wide variety of dishes to chose from, being sushi fans, we have particularly relished their buffet service. The buffet is priced at INR 1299++ with unlimited alcoholic beverages like mojitos, martini or beer and INR 1199++ with non-alcoholic beverages like fresh lime soda, jasmine team or choice of soft drinks. These options are available only during lunch hours from Monday to Saturday and during dining hours on Tuesday and Thursday. The opening hours of the restaurant are from 12 noon to 3:30 p.m. and 7:00 p.m. to 12 midnight through the week. Now you must be wondering if the buffet option is available on Sunday or not? Don’t be disheartened, the Sunday brunch (12:30 p.m. to 3:30 p.m.) offers the same buffet at INR 1999++ with alcohol and INR 1699++ without alcohol. If you would want to club the buffet with unlimited Chandon Sparkling Wine, then the package sets you back by INR 2199++. We have been to the place over a weekday, as well as weekend and have noticed the place getting packed by 1:30 p.m. Hence it is advisable to book a seat in advance if you are planning to visit. Spread over 10,000 sq. ft. on a single floor, the restaurant has a dining area, a grill room and a bar. 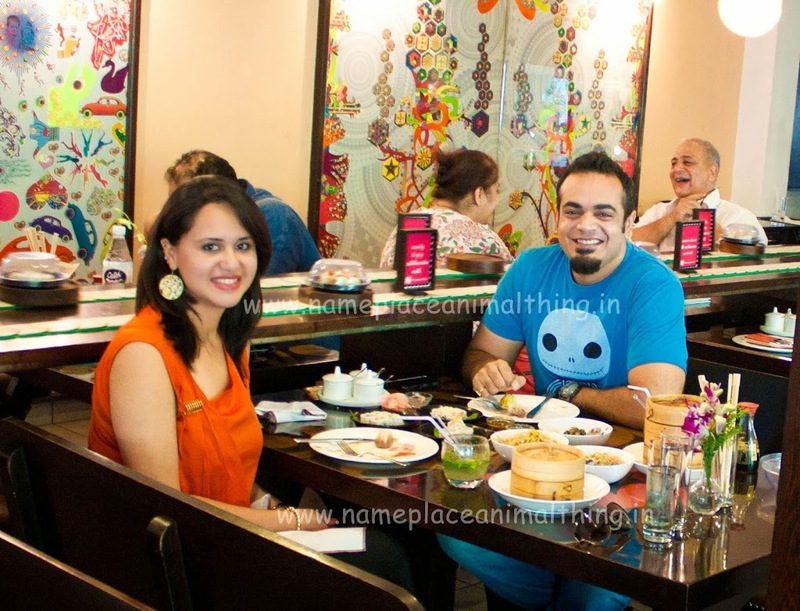 It is located at the Community Centre, NewFriends Colony near Surya Hotel. The surrounding location is not the finest and gives you a feel of a street market. Parking is available outside the community centre. The entrance is at the ground floor and a flight of stairs take you to the restaurant on the first floor. There are no elevators, in case you are going there with elder members in the family. The entrance on the first floor is the meeting point of the three key areas – Dining Area on the right, The Grill on the left with a conveyor belt and The Bar. The ambience is pleasant with modern baroque patterning. Once you have taken a seat, the menu option will be available for you to mark your choices spread between vegetarian and non-vegetarian. The variety is really excellent. From the buffet, you can select soup in starters, followed by 6 varieties of dim sums and sushi including 3 veg and 3 non-veg options for each. 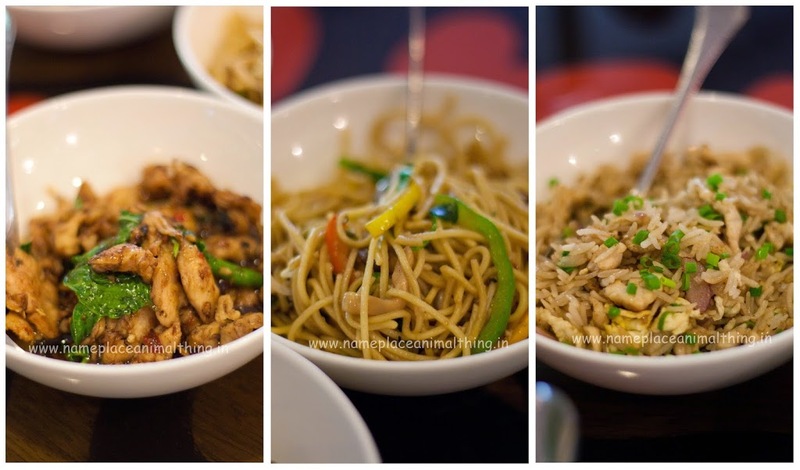 In main course you can select a noodle / rice bowl with your choice of gravy and pick a desert from a variety of 4 options listen in the menu. Beverage option depends on your choice of alcoholic or non-alcoholic buffet. If you are a sushi fan, you must consider taking a table in the grill area where you have the option of a conveyor belt. Not only does the belt save the time and but also saves you from the trouble of repeating the order again. But you must remember that the conveyor belt only serves the Sushi and for dim sums and other dishes, you will have to rely on the waiter. Our favourite is the Prawn Tempura Roll followed by the traditional California Roll. 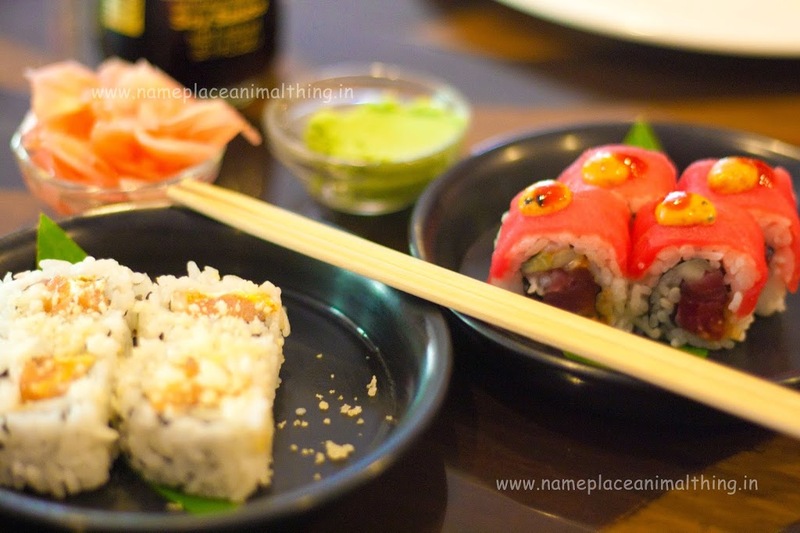 The Tokyo Spicy Tuna Roll comes a close 3rdfollowed by Salmon Uramaki with Cream Cheese. The dim sums are one of the finest we have had so far and are served steaming hot in the traditional box made from bamboo. 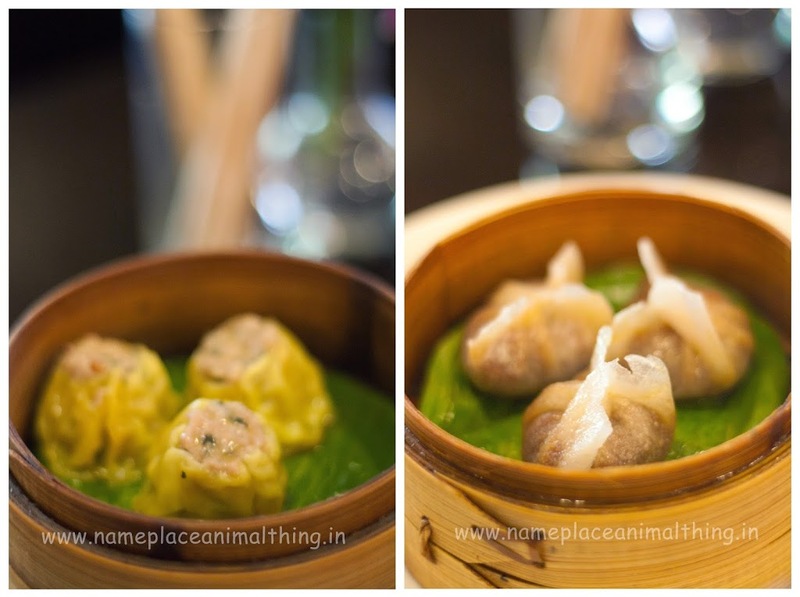 You must try Crystal Duck dumplings, Prawn Har Gao and Chicken dumplings. The drink options are good for accompanying the meal and we generally relish the unlimited Mojitos and Summertime Martinis from the menu. Last but not the least – the desserts. 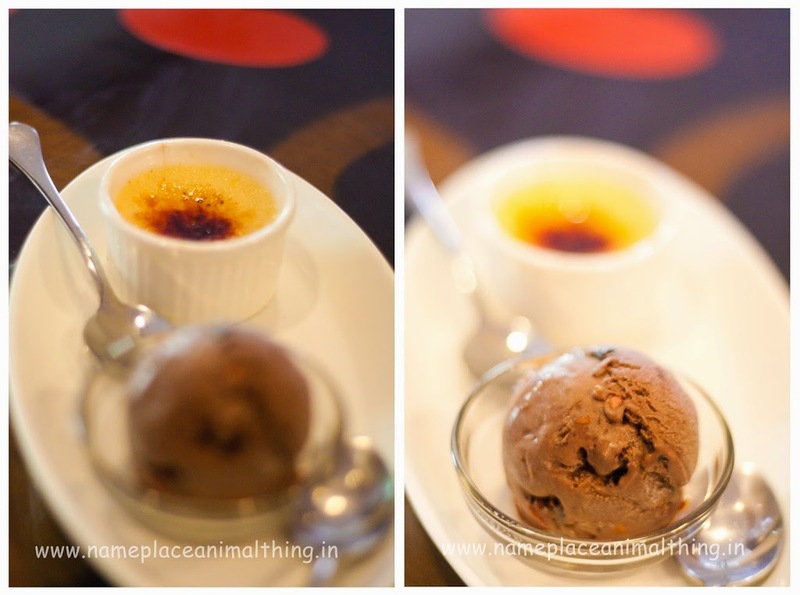 You must try the Crème Brûlée and the Belgian Chocolate Cheesecake. You only wish that this part of your meal was also unlimited, but you will be able to control your calrie count as the portions are small but sufficient to tantalise your palates as you end your lazy afternoon meal. The service is pretty decent; the staff very courteous and friendly. This is a place you can only enjoy if you are in a mood to sit back and relish your favourite cuisine on a lazy afternoon. We have never been to this restaurant during dinner hours. Before calling for the bill, do cheque if they have offers on specific credit cards. 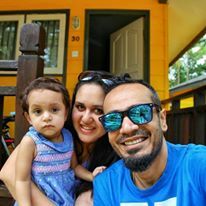 We had an on-going offer on Citibank credit card where we got 15% off on the total bill. Yum Yum Tree is one of the only places where we walk in with our eyes closed and have never been disappointed.